You receive a set of eight individually shrink-wrapped portions of Sugru. There are many different colours to choose from. 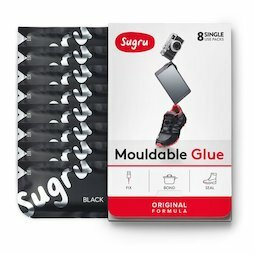 The manufacturer's video illustrates countless applications of Sugru. A set contains eight single-use 5 g packs of Sugru. Sugru achieves a strong chemical bond with almost all materials, such as aluminium, steel, ceramic, glass, wood and most plastics, e.g. Plexiglas and ABS, and rubbers, e.g. silicone and butyl rubber. Sugru can be used at least until the printed use-by date. Tip: When you keep it in the fridge or freezer, you can up to triple that time frame. Sugru is also electrically isolating and can therefore be used to repair a cable. Mould Sugru into a ball and wrap the damaged part with it. After hardening the compound stays flexible, so the cable is not stiff there. Sugru is skid-proof and therefore perfectly suitable as a replacement foot for household appliances. Here, a dishwasher was repaired with Sugru. It has to withstand aggressive detergents and high temperatures, which is not a problem. Finally, it's crystal clear which side is "hot" and which one is "cold"! Colourful Sugru holders and hooks adhere securely to kitchen tiles. Little pieces of Sugru around the corners of a smart phone protect it nicely against glass breakage.